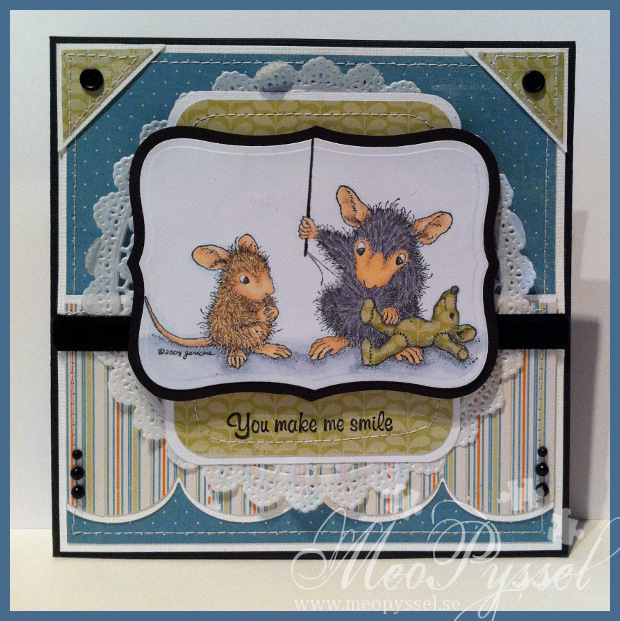 So welcome to another biweekly challenge for House Mouse and friends Monday Challenge. This weeks theme is “it’s all about weather”. I decided to go with sunshine due to the beautiful weather outside. The image is from the House’s Feathered Friend’s Sing your heart out. I really love this image and I really think it look very different from my other due to the red flowers. The clouds is as usual made with tumbled glass and this time I tried to have more space between the clouds. All the papers are from My Minds Eye and i used this weeks Sketch Saturday for inspiration for my layout. 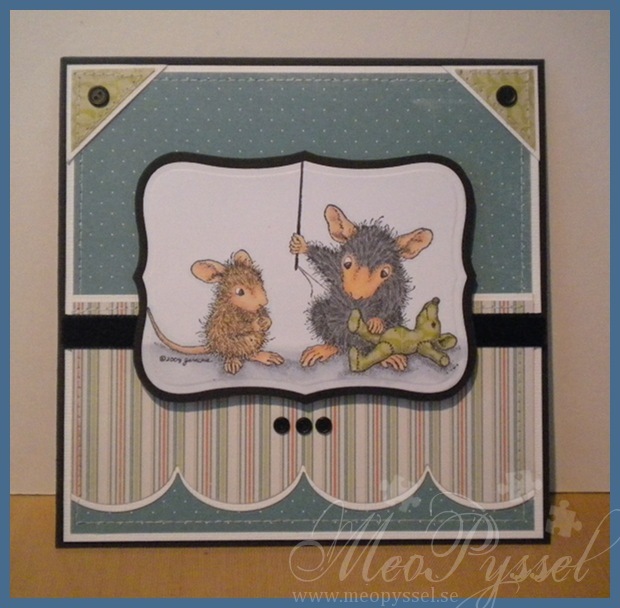 House Mouse – Sing Your Heart Out. Imaginice – Sunshine. Ink: Distress Ink- Tumbled Glass. Archival Brilliance – Graphite Black. Memento – Tuxedo Black. Dies/Punches: Spellbinders – Nestabilities – Large Retangle. Fiskars – Threading water. EK Success – Medium corner punch. So this weekend i have spent mostly redoing an old card I was unhappy with. I made the card about 6 month ago and i just felt that it was to cold, strict and empty so I finally sat down and made something with it. I tore of the image so I could manage the background a bit better. I added a doily to give a bit of a softer look and then the green centerpice so avoid the emptiness. The sentiment if from another House Mouse set. I reattached the velvet ribbon and then added the black pearls instead of the black brads I had before. Here comes a smaller before and after shot. The colors look a bit different and the true image is somewhere in between. Have have to admit myself to be a bad godmother to little Theo. His birthday was this weekend and he still haven’t got a birthday-card. I started on but i have had a hard time getting back to everyday-life after the wedding and after-wedding-stuff. But i finally finished it so it will go in the mail in a second, better late then never I hope. Anyway… I colored in one of my new stamps from the Greeting Farm’s set Just for You. I just love The Greeting Farm’s boys, not that to fond of the girls strangely enough. I colored him after the paper “Wish” from the Mind My Eye’s collection Fly a kite. I really like how the hat and shirt turned out, i like my latest buy of Copic more and more every day. The Paper is from My Mind’s Eye and the nice border is from the edge of one of the papers in the same collection. I have distressed the blue papers with Broken China and the green with peeled paint. The gray cardstock have been inked with memento’s tuxedo black. I also doodled around the edges to get a more whimsy and fun look. The greeting is handwritten by me and means “Congratulations”. The banner is made with my new die from MFT, the First award ribbon-die. I love the banner shape and just get annoyed when they don’t get straight so I bought the die – and it’s perfect! You will so see more banners from now on! The Number one is put on a tag from Tim Holtz’s Tiny Tabs and Tags, and i backed the tag with a gray paper that i cut with a nestabilitie circle. Dies: Spellbinders – Nestabilities – Lacy Ovals, Ovals, Circle. Tim Holtz – Tiny Tabs and Tags. My Favorite Things – Stacking Stars, By the number, First Place Award Ribbon. 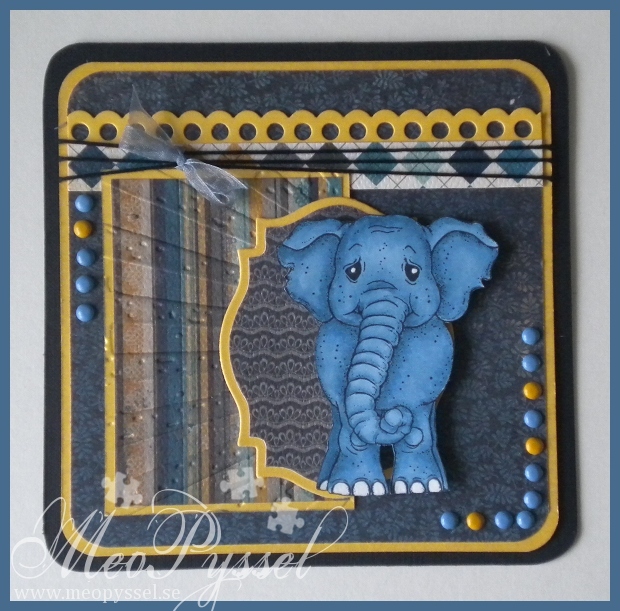 This weeks Challenge over at the Sweet Stampin’ is Paper Piecing, so lets you all your pieced images. Our sponsor this month is a £10 voucher from Joanna Sheen. And our weekly sponsor is Bunny Zoe with a £10 gift voucher. So todays card is featuring paper-piecing. I paper pieced the stuffed animal with the green paper from this collection that I also used as a corner treatment. I have also tried my new sewing-machine for the first time for my cards, and I just love it. I have to fins a place for it so I can use it more often. The brads looks like buttons. The card feel a bit empty I know so maybe I’ll redo it later, but now I need to go shop for fabric for the tablecloth for the wedding. Short one today, I have so much to do about the wedding. Next update will probably be my napkin-holders. After that I’ll be back in august, after the wedding and honeymoon. Other: Spellbinders – Nestabilities – Labels 8. My Favorite Things – Jumbo Scallops. 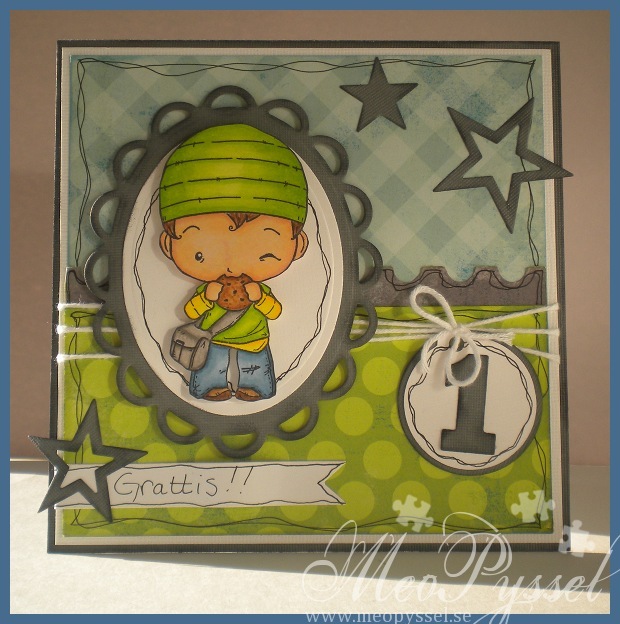 I’s time for another challenge for Sweet Stampin’ and this weeks theme is Ribbon and Bows. Our lovely sponsors for this month is still Joanna Sheen with a £10 voucher and our weekly sponsor is Crafty ribbons with TBC. 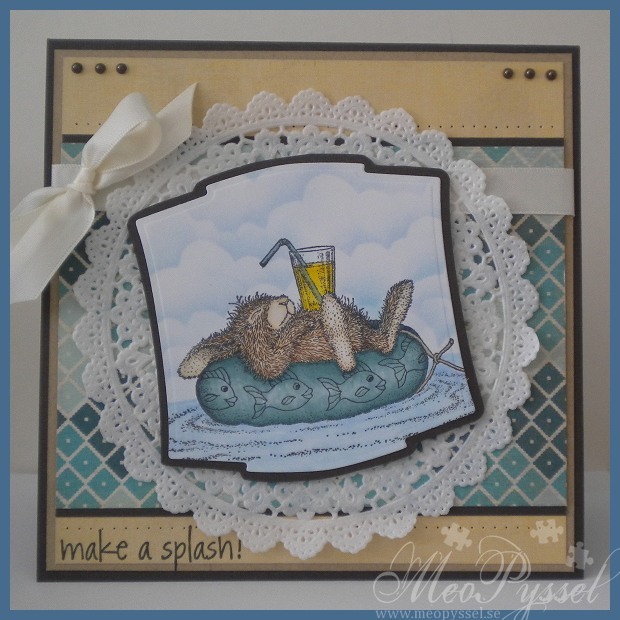 So I just had to make another card with the lovely Bunny Cruise. Once again i did the bath-ring all in one color, I don’t really like the fishes and don’t really wanna accent it. The image is colored with copics and the clouds are made with some tumbled glass. The image is framed with my new and wonderful labels 2. The papers are from My Minds Eye’s collection Indie Chic: Nutmeg. The image is a bit off, the yellow paper is a bit more lemony in real life. The greeting I used is from AmyR’s underwater-set. My embellishments consists of a white doily, some paper piercing, some small brown pearls and a cream-ribbon. Paper: My Mind’s Eye – Indie Chic – Nutmeg. 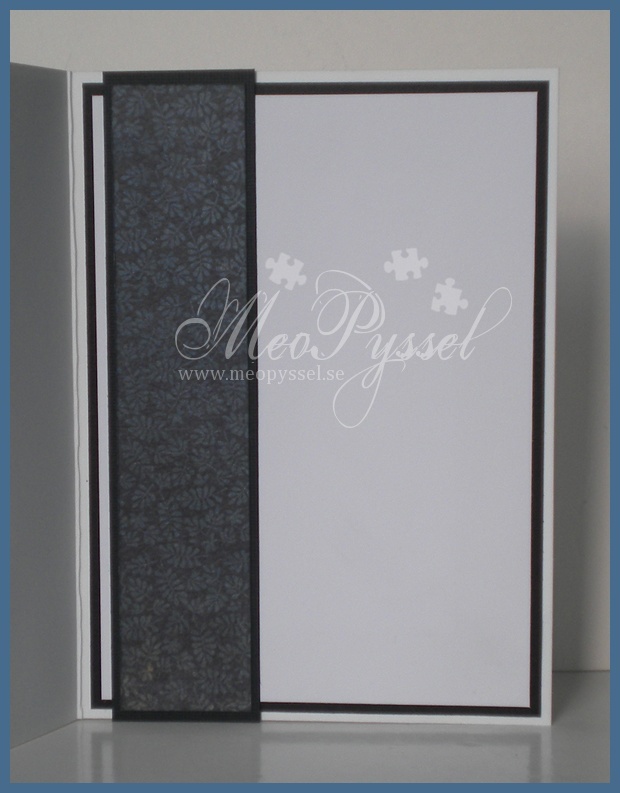 Spellbinders – Nestabilities – labels two. This week my eldest cousin graduates and unfortunately neither me or my family will be able to go. Instead I have made this card to arrive with our gift. I’m at writing moment really sick and I can’t believe I actually succeeded to make a card. I have to admit that the inside and my handwriting is terrible but the front is really good considering. The image is The Greeting Farm’s Edward and the paper I used is My Minds Eye. 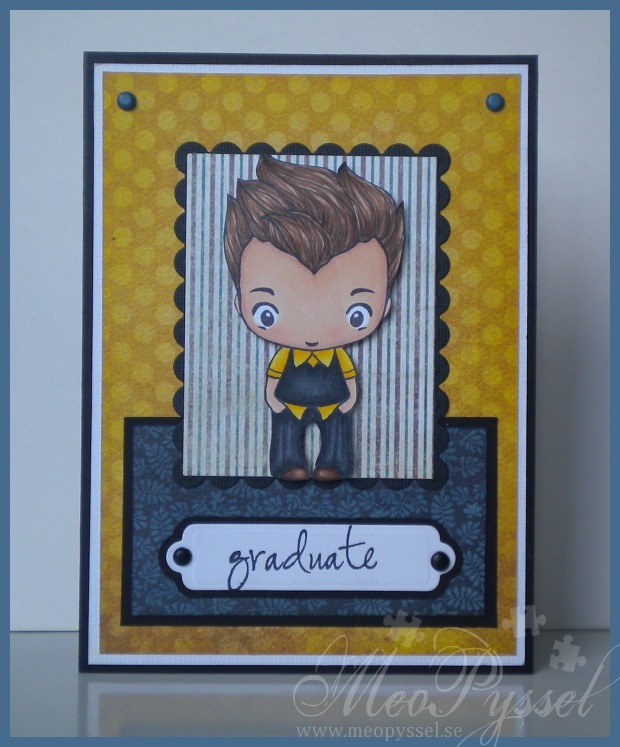 The Swedish colors are yellow and blue and I wanted to make a card in these color sense they are traditional graduation colors here. I got my graduation-papers out and really disliked them all all of a sudden, I wanted more depth. So i went through my papers for anything yellow and blue and found these. The sentiment is from Amy R’s Big Words & Handy additions set. The yellow paper have been heavenly distressed with Mustard Seed to get a bit brighter yellow. Stamp: The Greeting Farm – Edward. CC Design – Big Words & Handy Additions. 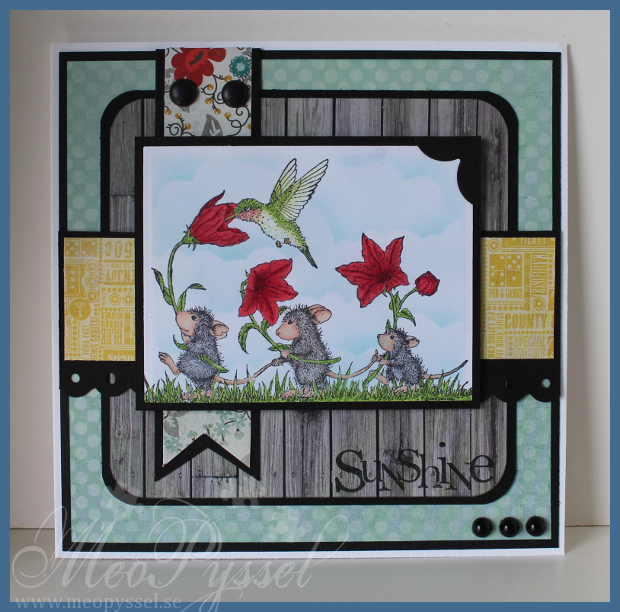 Dies: Spellbinders – Nestabilities – Large Scalloped Rectangle, Large Rectangle. Spellbinders – Shapeabilities – Double ended Tags. 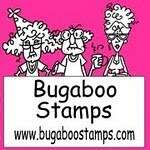 This Weeks Challenge over at the Sweet Stampin’ is Moon & Stars and ours sponsor for this week is Bugaboo witch the prize of 7 digis and our monthly sponsor Joanna Sheen with a £10 voucher. So after looking through my stamps for something to match Moon and Stars i found this stamp from The Crafter’s Meow set Happy Owlentine’s day. Sense I wanted a night-scene i also looked through my papers and found these from My Mind’s eye, the Stella and Rose collection. The vertical paper is a dark blue but it do get a more gray tone combined with the gray paper. I based my coloring after this gray paper and all colors are chosen from a gray perspective. The moons texture is made withe the blender pen and I made the clouds with my cloud stencil and the London Fog memento Ink. I did have some Paris Dusk on the stencil that transfered onto the paper. It gave a bit of a depth but the Paris Dusk mostly shows on the top part. The sentiment is from the same stamp-set and it’s stamped with Archival’s Brilliance Graphite Black. The little banner have been shaped with a pen so the “need” part is raised and the edge of the banner is raised. 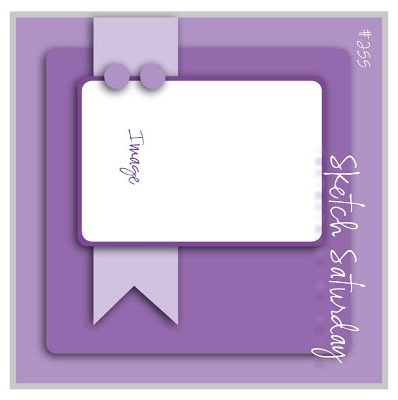 I used this weeks Sketch Saturdays Sketch for the layout. I also tried a new cardsize for this card. I think that my normal size (10x15cm) is a bit to narrow and I don’t really like the proportions so I asked Kim Teasdale what size she uses (I just love all her cards!) and I learned that she uses approximately 11x14cm (she of course have her measurements in inches). I thought that felt a bit short so my card is actually 15×11 and I think it’s better then before but I have to try a 11×14 soon. But thanks Kim! 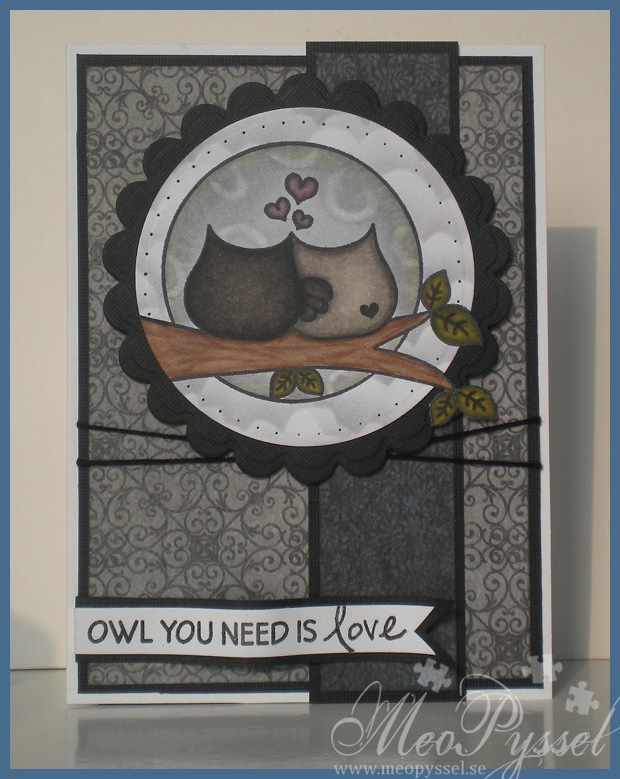 Stamp: The Crafter’s Meow – Happy Owlentine’s Day. Other: Memento – London Fog, Paris Dusk. Spellbinders – Nestabilities – Large Circle and Scallop Circle. Archival – Brilliance – Graphite Black. So my lovely godson Theo will get baptist this weekend and he will be officially mine and Björn’s godson, so i made a card to go with his gift. We have bought cufflinks ingraved with “Theo” and I hope he will like them when he gets older. I sat a long time thinking about what stamp I could use for this card, I always think it so hard for a little guy. But i finally decided to use Magnolia’s Parrot and the Jungle leaves (from the pet collection). I had a bit of a problem to make the masking to get the parrot sit on the leaves. I had to first stamp the body of the Parrot and then masking it off. Then i stamped the leaves on top and masked then off also so i could stamp the feathers so they would peek out from underneath the leaves. The parrot and the leaves are of coarse colored with copics. I didn’t have any muted blue-greens so i used a lot of gray over so dull it out a bit. The frame is Spellbinder’s deckled rectangles and i made the sky behind with a combination of Faded jeans and Broken china. The Papers that i used are from My minds Eye Out of the blue collection and the Fly a Kite collection. And I just love the trains – they are the reason i bought them from the beginning. The letters for “Theodor” is Provocraft’s Baby Face alphabet. The black brads is some generic kind that i buy lots of and the orange ones, bot big and small, is from Paper Wishes Disney-set. I have been trying to practice my copic-skills. I’m not a patient woman so i think it have gone so so but i like the results on this elephant. The shadowing is there but discrete but i like it, i think i succeeded on give it a bit of depth. I was a bit messy with the coloring so i needed to reinforce the white in the eyes and feet with a sakura pen. 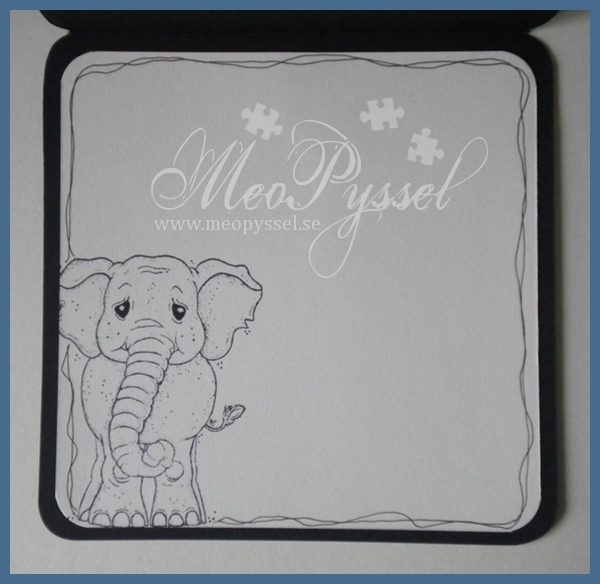 The cute little elephants is from Magnolia and the Papers of the card is from MME collection Stella and Rose: Hattie. I did accidentally cut of the tail of the elephant while cutting it out and i left it off so that might vary from the original stamp. The yellow-ish cardstock that is used for the framing is gold-colored and has a nice shimmer to it. I used Tim Holts’s embossing folder Rays on on of the blocks and to make it appear a bit better i gently distressed it with Weathered Wood. The border on the top part is one of the two borders in Nellie Snellen’s Lacy Borders set. The embellishments are simple the yellow and blue brads and the bow of almost transparent blue ribbon on the black thread. The ribbon is not tied hard so it can slide all the way across the card.